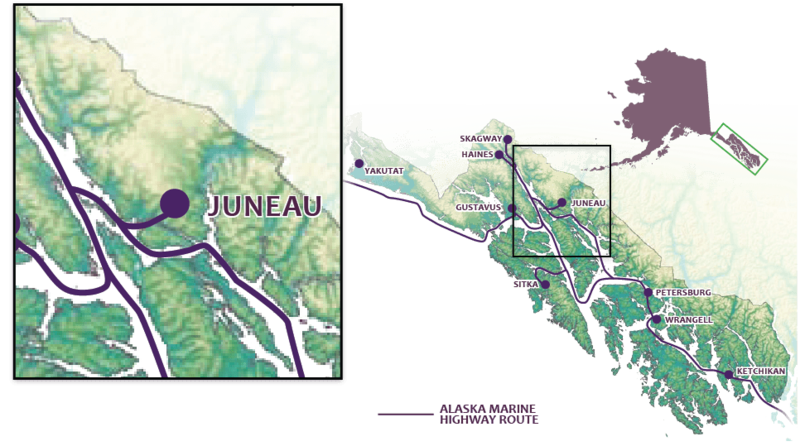 The Juneau Icefield, the fifth largest icefield in the Western Hemisphere, sits in Juneau’s back yard, stretching across a 1,500-square-mile area that straddles the boundary between Alaska and Canada. The Mendenhall Glacier, easily accessible, is the most popular of the 38 glaciers produced by the icefield, offering recreation opportunities that include hiking trails maintained by the U.S. Forest Service, glacier trekking and dog sledding. Tracy Arm is a dramatic glacial fjord accessed via a day-long boat trip from Juneau. The fjord triggers sensory overload, with steep granite walls towering over the water’s surface and the twin Sawyer Glaciers at the fjord’s far end. The main attraction is the glacier itself as it calves off huge chunks of clear blue ice that cascade into the water and become instant icebergs.